For the first time in Belmont University history, eleven physical therapy graduate students and a clinical instructor spent their spring break on assignment in Guatemala City, Guatemala. At the Hospital Infantil de Infectologia y Rehabilitacion (Children's Hospital for Infectious Disease and Rehabilitation), home of the only hospital PT wing in all of Guatemala City (population 5 million plus), the Belmont PT graduates worked with children with developmental delays as a result of having gone untreated for normal childhood diseases and also with trauma patients — accident victims or those whose illnesses have led to brain damage. They also taught modern physical therapy to Guatemalan doctors and nurses. 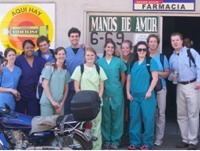 The team posted pictures and narratives of the March 3-10 trip in this Physical Therapy Missions Blog.